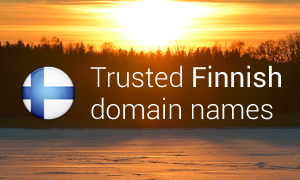 The demand for trusted Finnish domain names continues to grow with about 50,000 new registrations a year. Currently, the number of valid .FI domain names exceeds 362,000 and this trend is expected to continue in the coming years. Since the introduction of the .FI domain in 1997, the number of names registered under the extension has increased over 40-fold. Up to date, about 13 percent of domain names under .FI are held by private individuals while about 80 percent have been registered by organizations. The extension’s success is largely due to its reputation as one of the most secure domains world-wide. Thanks to the introduction of reinforced security measures by the Finnish domain registry, the Finnish extension has established its position as a trustworthy namespace on the internet. At the heart of the improved .FI domain name security service is the DNSSEC (Domain Name System Security Extension) which strenghthens the information security of the name service. The service also secures the integrity and origin of information, ensuring unaltered information exchange. An additional improvement due in September of 2016 is switching entirely to the international registry-registrar model allowing customers to acquire all domain services at one place – their own registrar. This widely used service model ensures coherence and allows registration of names under various domain extensions all under one roof. Web Solutions is a reliable domain registration service provider with 17+ years of experience and top quality customer care. We are a global leader in providing Local Trustee Service for domain registrations requiring local presence, such as .FI domain. If you need assistance in registering a Finnish domain name, an experienced team of consultants will take you step by step through a registration process and answer any questions you might have. Just give us a call on +44 (0) 208 133 3994 or contact us at support@web-solutions.eu.